#FutureofMen – Who sets the Agenda? As I write, I am back and forth with a distraught mother whose son left rehab last week and he hasn’t been home four days. Thing is, knowing a bit of his background, I wouldn’t be surprised if he has relapsed. Relapse is very much a part of the recovery process. My main recommendation on his admission to rehab was that he is helped to resolve his relationship to his mum and his absentee dad. I have seen the way he treats his mother – with deep disdain. Repeatedly. He has anger issues, abandonment issues, rejections issues (and all those issues we think came from the west) and he takes it out on himself, his mum and the world. Thing is, the world will not care very much. This brings up my, well, bizarre experience at the Future of Men session on the last day of the Storymoja Festival on Sunday, 21st September 2014. I attended the session as a “consumer” of the Festival. My whole experience of the festival was that I did not belong here. I did not deserve to be here. who also edited my book? My desire to write another book is still at the desire stage. Who? Me? Sitting in a very enlightening debate session that was discussing Shakespeare relevance in today’s world? And discovering how much of the everyday English that we use is in fact, Shakespearean? Who? Me? A reluctant artist and an even more reluctant writer? You see, I didn’t do literature in college and, in fact, I dropped it in high school to replace it with Physics- which only real men take – and which I never could understand one bit. Who? Me? To sit in a lecture given by the iconic Wole Soyinka, whom I always perceived as being larger than life as portrayed in the media and then to my consternation, confirmed that, indeed, he WAS correctly portrayed because in that dome, on that Saturday, he was larger than life. The Future of Men: What is it like to be a man in Kenya today? So here I was attending The Future of Men session to get more of a confirmation than an answer that indeed I had wasted my ticket to the ‘Imagine the World’ themed Storymoja Festival. That the future was not for this man. The premise of the conversation was a Facebook page that had recently been set up to expose irresponsible fathers. Now what did that have to do with me? I had further confirmation that I was in the wrong place and I should have attended the Art Social Media and Identity session, perhaps, as it sounded right up my alley. That is if they were only going to talk about Facebook status (statii?) update issues. Now, I will never know. 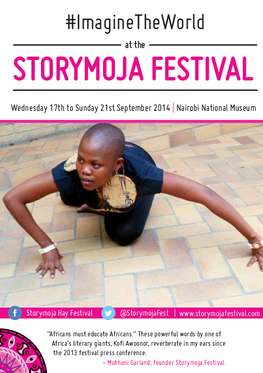 And that was the thing about The Storymoja Festival menu. You could only have one offering at a time and drool about the others. Or wait until next year to revenge. Or perhaps attend with a band of friends who would separate and compare notes later. My attention peaked when a young man spoke up and said that he only came to the Festival on that day for this particular session. His expectation of the session was that he would hear how other men were doing in the business of being men in business or as fathers and I add, as brothers, husbands, sons, boyfriends, uncles, employers, politicians. He felt cheated of what was otherwise a great opportunity for men to expound on what real men looked like. And this is exactly what he was not getting. I joined the audience in clapping for him. Not too sure why, though. The discussion went south from this point on. The panelists, I felt, ceded the discussion to the women in the audience, who were the majority. I couldn’t help feeling that this was going pretty well for me. I was indeed a doomed soul. I really didn’t deserve to be with all the sorted out people in the Festival. Well, too bad, it was the second last session of the last day and I couldn’t transfer my ticket to any one even if I wanted to. You see, I am running a fledgling business whose efficacy I am yet to determine, I don’t have Range Rover (I think it was mentioned, or I heard it once or twice that it was the SI Unit of being a real man), my bank manager doesn’t know I exist, my landlord is praying for me. I am struggling with the process of raising my teenage son and I still waver in my spiritual walk, mainly because occasionally, no, frequently, I still hold on to the belief that my God’s benevolence is up for sale to the highest Range Rover owning bidder. That my claim to fame of being a published author was really a fluke and not a story well worth telling. Some of the women I spoke to after the session felt they were let down by the men; both on the panel and in the audience. I, too, couldn’t help but feel the same. The sexist remarks from both sides begged for a solution. And poor me. What was I going to do now? Though I was in the audience and not on the panel, I had a contribution to make. I should have made it. I didn’t. I shut up. I apologise. The Future of Men is really under threat from the men themselves. And they do this very well without help from anyone else. Not least a Facebook page set up by a man. And this is what the women were ALL saying. The man threatens his own wellbeing and takes the whole society down with him. The Future (presumably a bright one) of Men can only be drawn up by men. Celebrated by women. But drawn up by men and their Creator. Faulty pillars can always be renegotiated, rebuilt or propped up with right values. Men need to admit and accept, not condone, that being a man is fraught with mistakes, failings and scars that paint up an authentic collage of manhood. That men must embark on that quest that would authenticate their manhood. It is an inside job. And it could be painful. And that’s ok because men revere pain. I am yet to figure out why. The Future of the Kenyan needs to take into account the present and the past of the Kenyan man. The fact that men hurt. The fact that hurting men hurt others. The fact that men can heal. That there is more than enough help to go round. That men must ask for help. That the rehabs I seek to populate for a living will go bankrupt or change their business because men are authentically expressing and validating themselves. And they are taking care of their women. I had somehow conveniently forgotten that speak, I must. Write, I must. Storymoja Festival jarred this in me. My son will be ok. We men are going to be alright. And now, I need to convince the distraught mum, that her son will be ok. I just need you, my fellow man, to assure her with me. And guarantee a bright future for her son, my son and yours. Author ChrisPosted on September 29, 2014 September 29, 2014 Categories Uncategorized5 Comments on #FutureofMen – Who sets the Agenda?